The MJM 50z is an eco-smart game-changer featuring advanced composite construction, an innovative layout and the latest stabilizing technology. Her stronger, lightweight epoxy construction results in a very low vertical center of gravity. That translates into greater stability, ISO-certified Category A seaworthiness, and an impressively comfortable ride. MJM 50z is the first motoryacht worldwide to offer the "no roll" Seakeeper Gyrostabilizer as standard equipment. 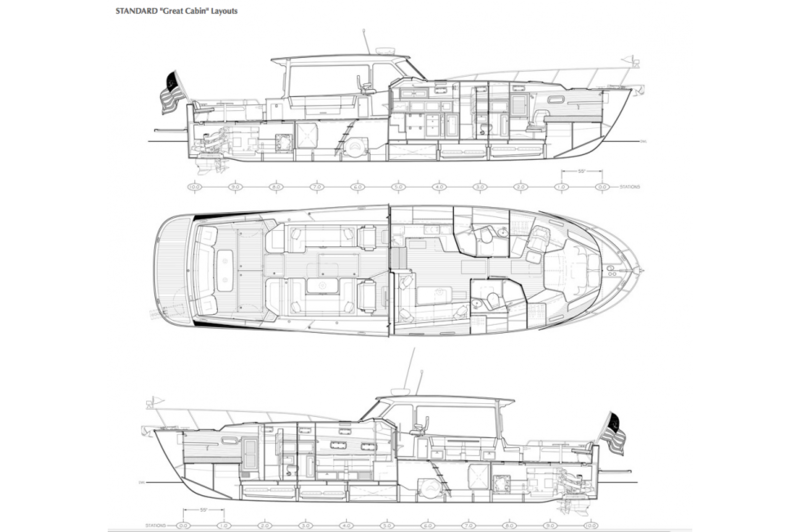 Adding further to comfort and livability: Her flush-deck layout from cockpit to helm combined with side boarding doors at floating dock height eliminates the many up-downs and boarding access challenges of other yachts. You want to look at your boat with pride and know you own a work of art. 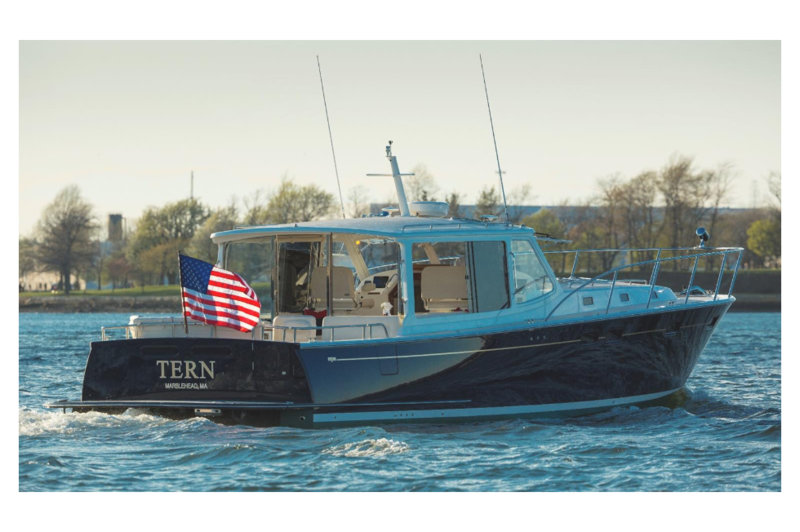 A boat that draws compliments on entering the harbor—not a "here today and gone tomorrow" styling. That's why Doug Zurn was chosen as the designer. He has the best eye in the business and created the Shelter Island 38 for singer Billy Joel. A U.S. design patent protects that unique MJM signature look. There are other important benefits of the 50z's sleek profile: Lower bridge clearance, greater stability for seaworthiness, faster hose-down after use, less windage and easier trucking overland. 1. Timeless Good Looks MJM’s #1 priority… and why Doug Zurn was chosen as the designer. He has the best eye in the business starting with the Shelter Island 38 for singer Billy Joel. 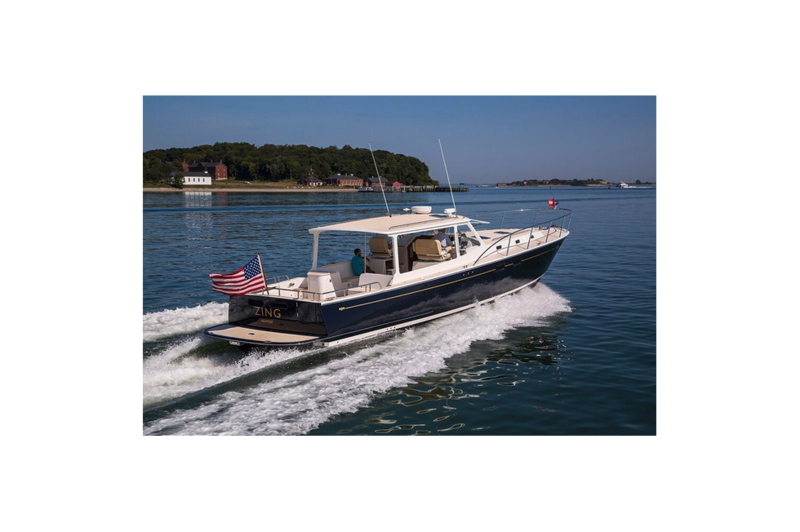 You want to look at your boat with pride and the satisfaction of owning a work of art, draw compliments on entering harbor and know this is not “here today and gone tomorrow” styling. A US Design Patent protects that unique MJM signature look. There are other important benefits of the 50z’s sleek profile: Lower bridge clearance, greater stability for seaworthiness, faster hose down after use, less windage and easier trucking overland. 2. 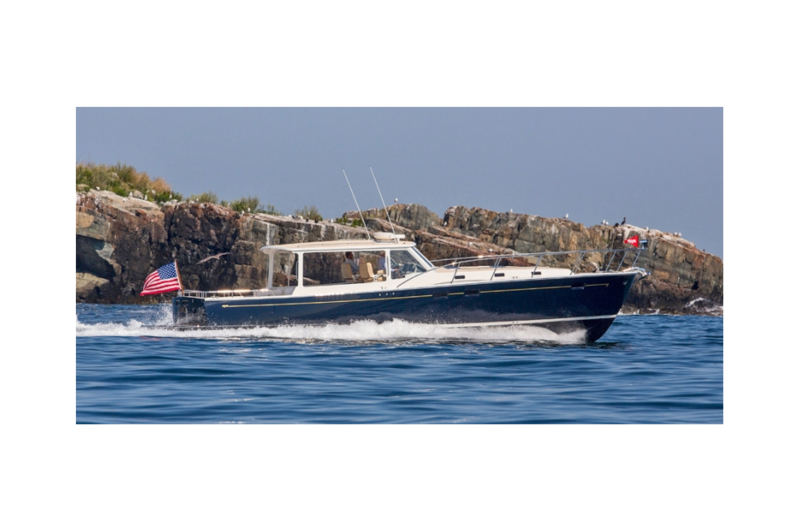 Greater Comfort and Less Fatigue MJM Yachts led the market in announcing Seakeeper Gyro-Stablizer as standard equipment on the 50z. SeaRay has now followed on their new 650. 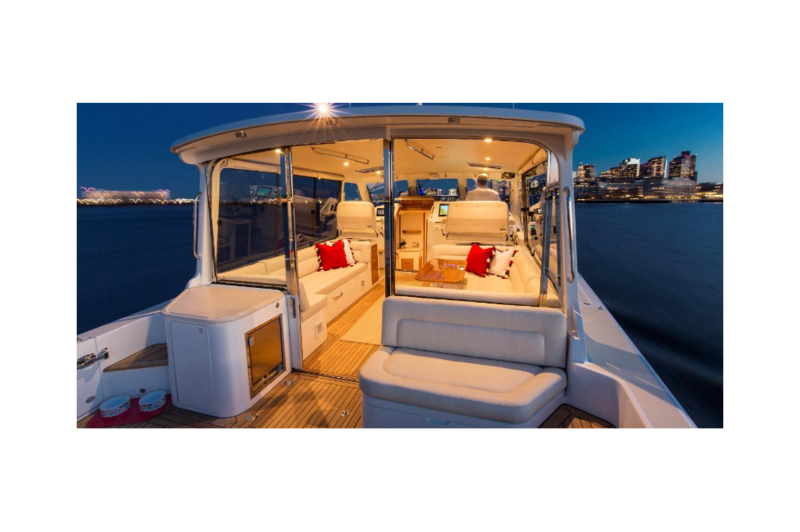 1500+ Seakeepers are now in service worldwide… mostly on large custom motor yachts. With this technological breakthrough, life on a powerboat will never be the same. No more rolling by day… and better sleeping at night. 3. Higher Quality Construction. Lighter and stronger pre-preg epoxy, Kevlar, Eglass & Corecell composite construction creates a yacht with less drag, a lower center of gravity and higher horsepower to weight ratios…resulting in in superior fuel-efficiency (28-30 gph @ 25 knot cruise), a safer boat with greater stability that’s more fun to drive. As boats become bigger, the MJM advantage becomes even more pronounced because construction weight makes up a higher percentage of the boat. The East Bay 50 displaces 50,000 lbs. The 50z… 32,850 lbs. at half load! 4. 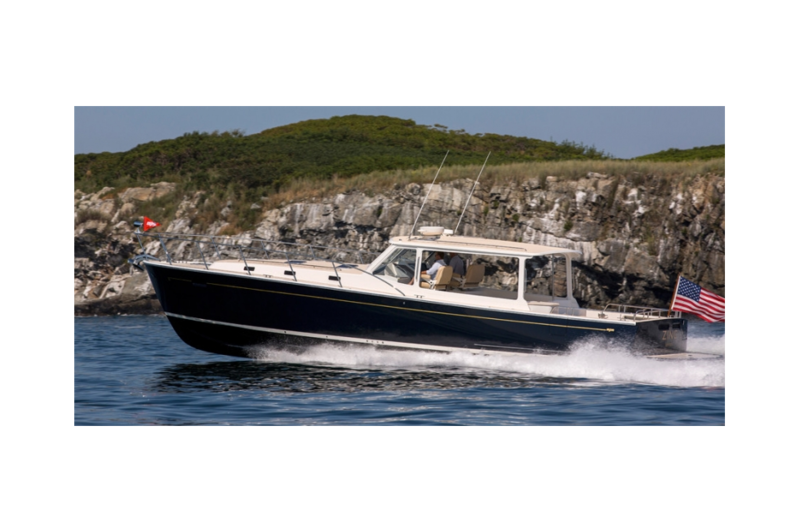 Better Performance The 50z with the standard twin Volvo-Penta IPS 600 drives has a top speed of 31.5 knots with a 28 knot cruise. 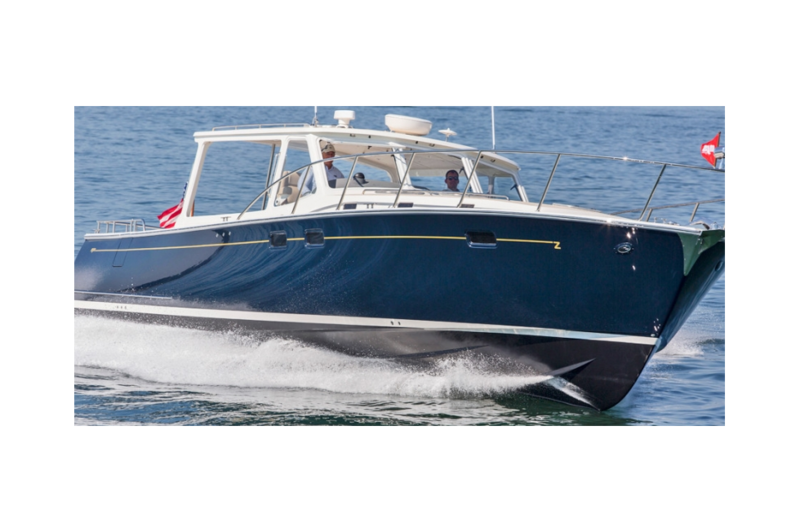 With the optional triple 435 HP Volvo-Penta IPS 600s, top speed is 40 knots with a 35 knot cruise. 5. Easier and Safer Flush Deck 50z have port & starboard side boarding doors at floating dock height onto a flush deck from cockpit to wheel. This is achieved because 50z, due to high tech construction, can utilize smaller engines... 8-10” lower than the next size up needed to propel other 50 footers. 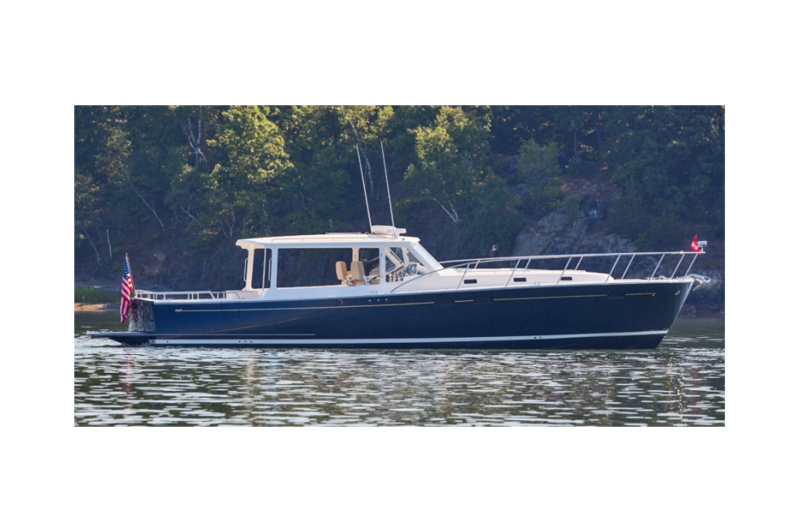 The Hinckley T48 has multi levels and coaming doors but still requires scaling the topsides. 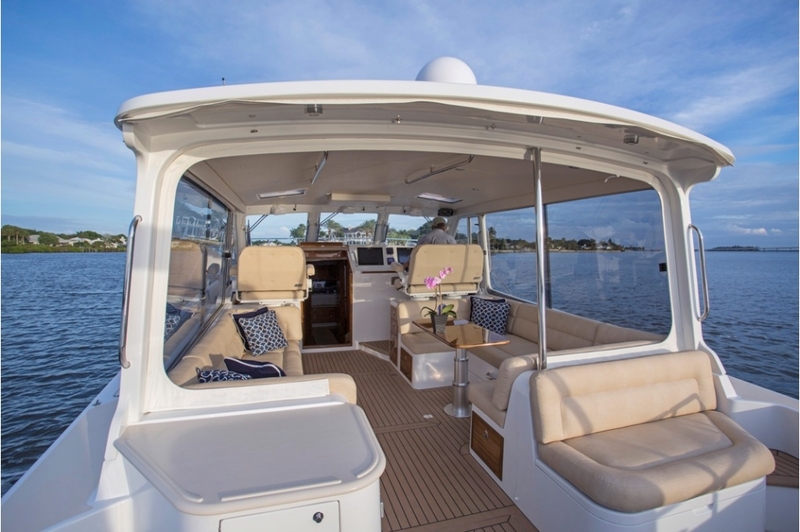 The Palm Beach 50 has a single level deck, but no side doors. The Sabre 48 has several levels from a low swim platform. 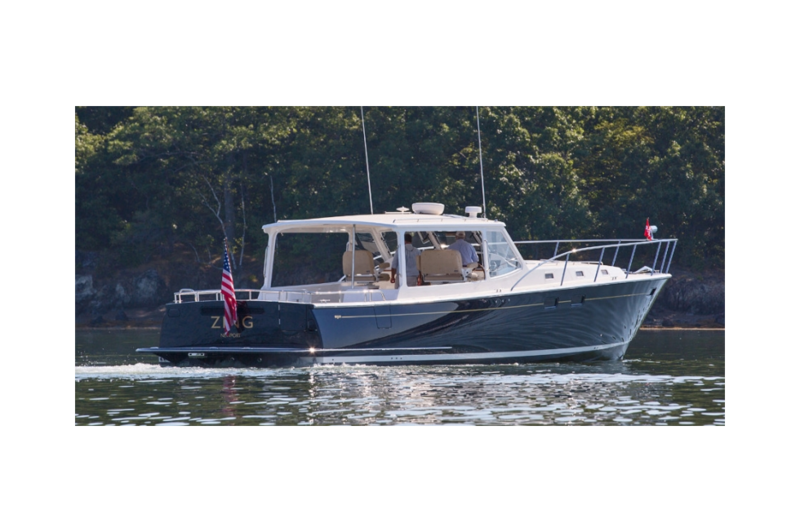 And, East Bay 50 has multi-levels and is the first among Down East designs to pick up on this MJM innovation, offering side doors as a $17,000 option. 6. Safer Entertaining Thanks again to the low profile, there are only 2 steps between galley to deck levels instead of 3-4… an important feature when serving food and drinks from galley onto the deck. Of course, on the 50z, one may also dine on the same level as the galley in luxurious privacy of the Great Cabin. 7. More Daytime Privacy Experienced cruisers know that 80% of cruising time is spent in port. They will not be happy long term with other 48-50 footers as there’s no place to sit below…just beds! So everyone has to crowd into the "salon" during daylight hours. There’s no place for the kids to hang out watching TV or playing games below while old folks are at cocktail hour on deck. The MJM 50z is a real category game changer! 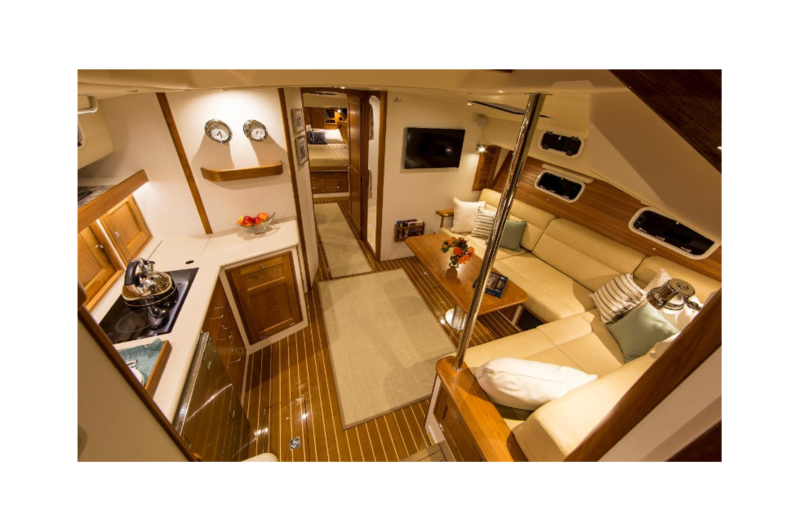 On a 50z you can have 2 cabins at night, each with matched en-suite heads and glass-enclosed stall showers as well as reading chair and a pair of large screened opening hull ports for fresh air and a view of the harbor... like not going belowdeck. 8. Great Cabin & Instant 2nd Guest Cabin A large L-shaped settee with combination dining/coffee table seats 6 and also serves as feet-to-feet twin berths which readily convert to a 50" x 80" double by lowering the table. A "Pullman Curtain" offers additional privacy from an area already closed off from “Flag Country” forward. 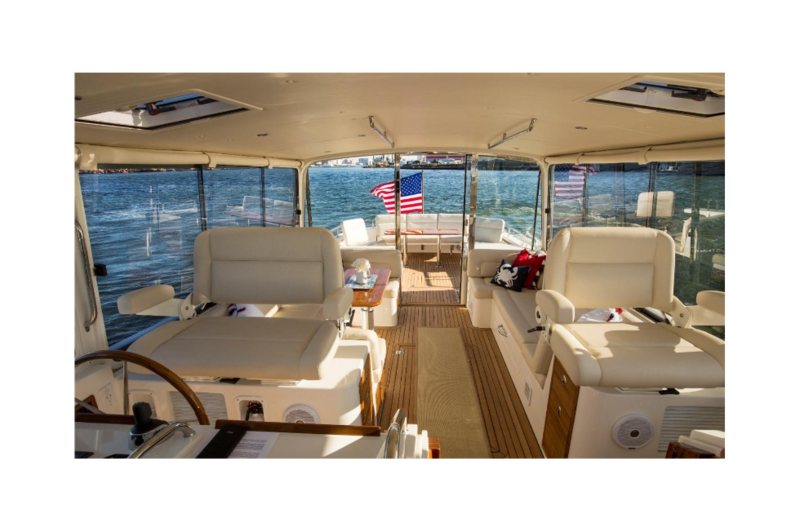 50z has a unique option which eliminates the need to choose between an open layout and one with two fixed cabins. This option features a removable and readily stored bulkhead with door that can be erected in minutes to create a completely enclosed guest cabin. 9. Cabin #3 at Deck Level to Sleep 3 More 50z has a more pleasant solution that claustrophobic 3rd cabin under the “salon”. 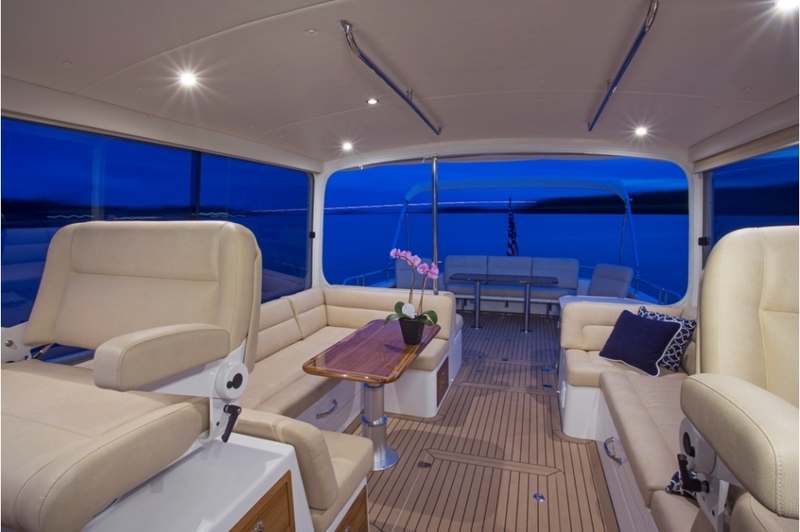 The 50z pilothouse at night can be completely enclosed by sunscreen/privacy curtains. 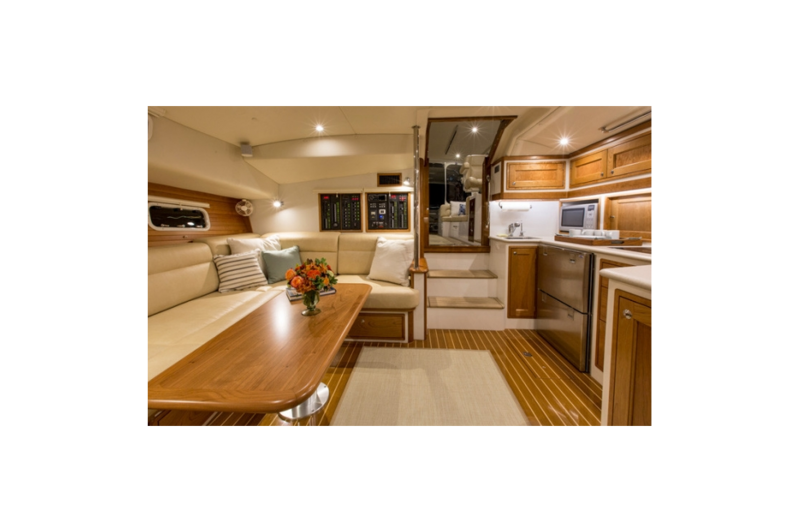 The starboard settee converts to a 50"x 80" double berth, while the port settee is an unobstructed, comfortable single. 10. 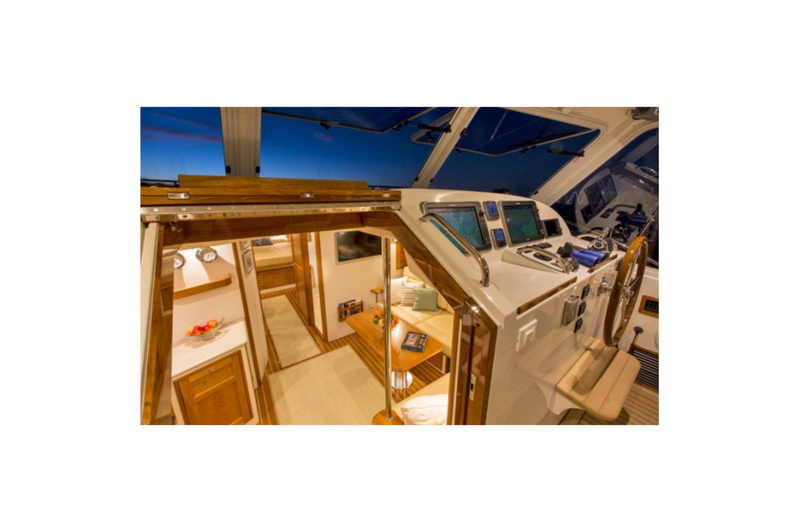 Bridge Deck of a 65 Foot Motoryacht 50z’s main deck actually has more space and the same all weather capability of a custom flush, air-conditioned, upper flybridge deck of larger motor yachts... which is where everyone wants ot be underway. So why include the dark 'salon' in the design? • Prepreg Epoxy, Kevlar, E-glass, Corecell construction. • Awlcraft 2000 paint w/3 coats clear on hull. • Side entry doors and transom door to swim platform. • Custom stainless dive ladder & grab handle. • Fresh-water chain/rode washer control at helm. • 42x20 pilothouse table on telescoping pedestal. 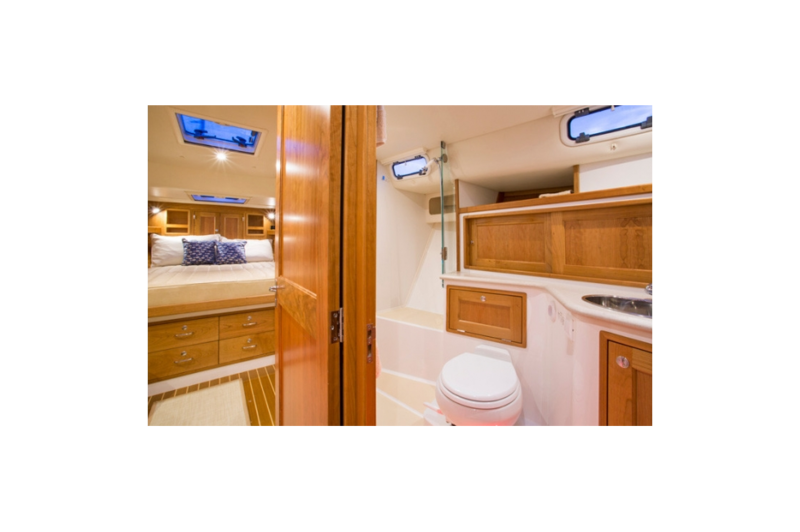 • 85x24 pilothse settees convert to double & single berths. • Ritchie SS-2000 4.5 Supersport compass. • 20-gallon stainless steel hot water heater. • 30 gallon holding tank w/macerator discharge. • Dish drying locker with drain & vent. • Ceramic 2-burner electric stove w/pop-up retainers. • 0.9 cu. Ft. Convection and microwave oven. • Victron inverter & chargers w/12v/120/220 Panels. • 735-ampere hour house battery capacity. • 315-ampere hour engine & genset battery capacity. • 78x26 by 99x26 “L” forms foot to foot twin berths. • Heavy Duty Pullman-style privacy curtain. 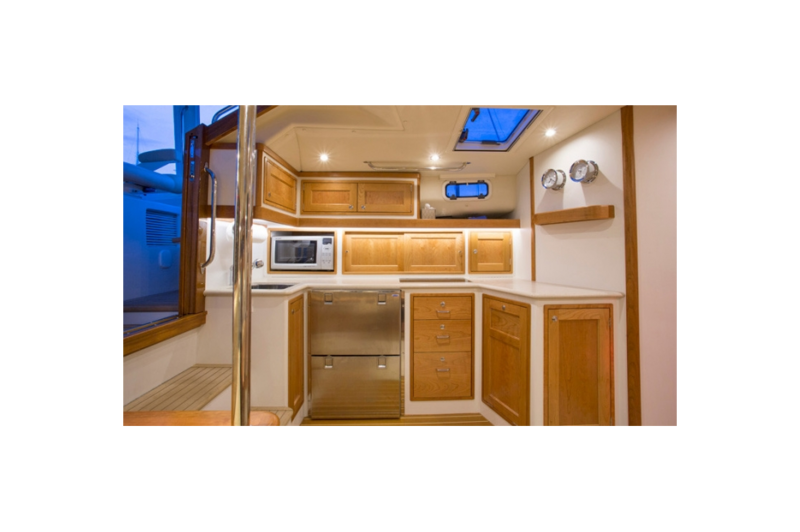 • 2nd Cabin, Wet Head & Dinette in lieu of Great Cabin. • Fusion MS-AV750 stereo w/CD/DVD/Sirius/MP3. • Catalina Spectra 340Z watermaker. • Rod Holders and Overhead Rod Racks. • Barnegat Docking Lights in Bow.